Umu-Nwakugwu-Umuokpobe kindred, AdukwaNwoke Quarters, Uruofolo Village, Akampkisi, Nri, in Anaocha Local Government Area of Anambra State. Amandi has 4 siblings, 2 brothers and 2sisters; his elder sister is deceased. Professor Amandianeze showed early promise, bagging a distinction in his First School Leaving Certificate in 1958. He subsequently obtained GCE London O & A Levels and TC-2A. After surmounting the challenges that comes with losing one’s father early in life, he proceeded doggedly with his Educational pursuit and bagged a B.Ed (Hons) degree in English (second class upper) in 1979 and M.Ed with Distinction in Curriculum English in 1981, both from the University of Jos. Amandi obtained his doctorate degree as a Commonwealth Scholarship Research Fellow, at Murdoch University, Perth, Western Australia in 1989. Professor Amandianeze is a professor of English Language Education and served as the Head of the Department of English Studies, Rivers State University of Education, Rumuolumeni, Port Harcourt. Prior to his Port Harcourt stint, he had served three tenures as Dean Emeritus, School of Languages (1993-2002), and two-tenure Director (1996-2000), Center for Continuing Education, Nwafor Orizu College of Education, Nsugbe, Anambra State; he was a member of the Governing Council (2000-2003). Professor Amadianeze served as part time lecturer and project/thesis supervisor for M.A. and Ph.D programmes from 2005 until 2012 at Nnamdi Azikiwe University, Awka. Amandi served in different functions and capacities in the Educational sector and holds the Fellowship of several bodies including the Institute of Sales Management (FNISM) of Nigeria and the Institute of Human and Natural Resources (FHNR), and membership of several professional bodies, including Reading Association of Nigeria, International Reading Association (IRA), Linguistic Association of Nigeria, Modern Languages Association of Nigeria (MLAN), National Association of Language Educators, Arts and Social Science Forum, National Commission for Colleges of Education Curriculum Review and Accreditation Team, and National Association of Lecturers of English for Academic Purposes. An accomplished academician, Amandi contributed to many publications and academic journals published in national and international fora and authored several books. Amandi has been very active in his communities and in the development and preservation of Igbo culture. Amongst his numerous milestones, he was the founding Secretary of Nri Sports Club (1970-1980) which sponsored Osadebe’s Nri Sports Club album in 1978; he served as the President-General of Nri Progress Union (NPU) 1997-1988, and again from 2001-2005.In 1998 he delivered the acclaimed Nri Progress Union constitution. He was the Secretary General of the same body 1998-2001. 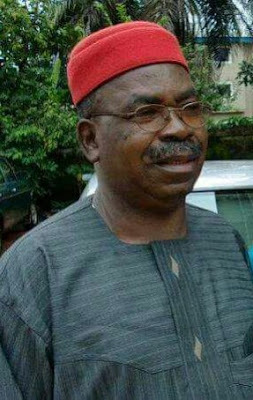 Professor Amandi was also the President General Ohaneze Ndigbo, Anaocha LGA and Vice President-General Ohanaeze Ndigbo, Anambra State 2003-2008. He served as National Secretary Anambra State Association of Town Unions, ASATU 2003-2007; he was the Founder/Chairman of NzukoAnaocha/Anaocha Leaders of Thought 2005-2009. Amandi let go of his Ozo title, Ugogbuzuo–OchakenaNri, after he came to Christ and has taken on the call name more apt with his life aspiration, Ochoudo-Nri. Professor Amandi has retired from the Civil Service after many years of fruitful service.Truly, a great and courageous man, his life is worthy of emulation and he has laid down a wonderful legacy for all who know him to follow.